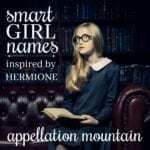 Looking for new vintage girl names? There’s a special sorority we’ll call The Abigails. These names boast a long history of use, and a few famous bearers. They come with an easy, obvious, built-in nickname. They might be called vintage revivals, but there’s a twist. Abigail never cracked the Top 100 until the late twentieth century. Abigail might sound like a sister for Emma, Alice, or Clara, but unlike those former Top Twenty favorites, Abigail remained rare for years. Let’s look for more names like this: names that barely scratched the Top 100 in their heyday. Names that don’t appear in the current Top 1000. They’re the new vintage girl names, ready to be more popular in the future than they ever were in the past. How many girls answer to Abby and Addie? It feels like Aggie would fit right in. And yet, just 85 girls were named Agatha in 2015. Former favorite Agnes fared slightly better – 189 newborns arrived in 2015. But Agatha never appeared in the US Top 300, and hasn’t ranked in the Top 1000 at all since the mid-1940s. Despite sharing an Ag-, the two names come from different roots. Agnes comes from a Greek word meaning chaste, and late became associated with the Latin agnus – lamb. Meanwhile, Agatha means good, from the Greek aagthos. While some dismiss the name as harsh, Agatha brings to mind the grand dame of mystery, Agatha Christie. That makes Agatha read vintage, and quite clever, too. Willa Cather immortalized Antonia in her 1918 novel, her enduring story of the American west. With -ia ending names like Olivia and Sophia in vogue, plus our affection for literary picks like Emma and Harper, Antonia feels like a natural. Except Antonia teeters on the edge of the Top 1000. From 2008 to 2013, the name fell out. It peeked back in in 2014, only to disappear again a year later. It stands in sharp contrast to masculine form Anthony, a name nearly always represented in the US Top 100. The long and lovely Antonella might substitute for Isabella, but Antonia seems like the more approachable form. One downside? The obvious nickname, Toni, could seem dated. But Annie works well, too, and seems very current. Move over, Grace. Elegant and sophisticated, Constance belongs with the virtue names but doesn’t seem quite as obvious as Hope or Faith. Even though the concept of constancy – to be steadfast and loyal – feels like a universally admired virtue. Constance has never appeared in the US Top 1000 during the twenty-first century, but we all instantly recognize the name. Nickname Connie long served as the obvious go-to; I’m more a fan of Tancy. Though really, I doubt a Constance would need a nickname at all. Worn by medieval princesses and even a twelfth century Queen of Sicily, Constance has more history than many a virtuous choice introduced by the Puritans. Just 142 girls were named Constance in 2015, around the same level as the last few years. Constance could be the perfect substitute for standards like Caroline, Charlotte, or Katherine. If you’re old enough to remember Little House on the Prairie, Harriet might make you think of the rotten Mrs. Oleson, mother to mean girl Nellie. But that’s a less and less relevant reference in 2017. Instead, Harriet belongs with vintage choices and hero names, too. It brings to mind trailblazing Harriet Tubman and writer Harriet Beecher Stowe. Sweet nickname Hattie is back in the spotlight. Plus Harriet evolved from Henry – a classic boys’ name very much in favor today. Toss in our affection for -et ending girls’ names like Violet, Scarlett, and Juliet, and Harriet could trend upwards. Despite having left the Top 1000 circa 1970, data suggests that Harriet is in the early stage of a revival. In 2012, just 89 newborns were given the name. By 2015, that number doubled to 179. Lucy, Lucille, and Lucia all qualify as mainstream favorites in 2017. Why not long, lovely Lucinda? It feels like a logical choice given the popularity of Isabella and Olivia. Miguel Cervantes probably invented the name for Don Quixote. Singer Lucinda Williams lends the name some more current creative power. The novel-turned-1997-movie Oscar and Lucinda might also be familiar. It’s a patchwork of references, none quite powerful enough to keep the name in the spotlight. We love our Lu- names. Nickname rich Lucinda could reduce to Lou/Lue, Lulu, or Lucy, to name just a few. All of this suggests that Lucinda should succeed on sound alone. But it isn’t so. A mere 140 girls received the name in 2015, marking a decline in use for the fourth straight year. Still, there’s no reason Lucinda couldn’t become a stand out among new vintage girl names. Take Molly and Ellie, add a healthy dose of British sensibility, and you’ll arrive at Millie. More popular in the UK that the US, Millie remains wearable throughout the English-speaking world. But no one is naming their children Millicent, and it’s a shame. Besides the easy nickname option, Millicent blends a certain sturdy, traditional quality with a surprisingly delicate sound. A mere 83 newborn Millicents joined the world in 2015. That’s neither a low or a high for the last decade or so. But for a generally familiar name, it’s astonishing how rarely we meet a girl named Millicent. Greek goddess of wisdom Athena is trending as a new favorite name for girls. How about the Roman equivalent, Minerva? In favor of Minerva’s resuscitation: the name refers to the goddess of wisdom, but shortens to the super-sweet Minnie. It’s the kind of name everyone knows, but no one is using – a tough combination. And the very wise Professor McGonagall answers to Minerva, too. So far it’s not quite enough. 51 girls were named Minerva in 2015, up from 37 in 2010. But that’s still a long stretch from the US Top 1000, or the over 2,000 girls named Athena. Still, with built-in nickname Minnie and that stylish letter ‘v’, Minerva could wear well. The youngest of the Crowley sisters on Downton Abbey, Sybil comes from the ancient world. A sibyl was a female prophet, attached to a specific temple or shrine. It’s been used in English for centuries, and made a reasonable choice for an early twentieth century-born character. Downton, of course, gave us two Sybils – mother and daughter. The show’s successful run boosted plenty of names. So it’s no surprise that Sybil is showing signs of resurgence. In 2015, 90 girls were given the name, up from just a dozen in 2010 – the year the show debuted. One more thing: the period drama reinforced the idea that seemingly nickname-proof Sybil shortens nicely and naturally to Sibby. Despite having left the US Top 1000 in the 1960s, Sybil feels fresh and modern today. Besides the Crowley family connection, there’s also a character in the Harry Potter series by the name. The spelling Sibyl is another option, but the y-first version has consistently fared better. Long, traditional, and nickname-rich, Theodora offers much to attract parents. And with Theodore, Dorothy, and Thea heating up, it seems likely that we’ll hear more of this name soon. For now, Theodora sits in style limbo. It hasn’t been given to more than 100 girls in a single year since the 1950s. In 2015, the number was just 80. Despite being rare today, there’s history galore to this name. It appeared in the the ancient world, was worn by a number of empresses in the east, and Saint Theodora inspired music by Handel. 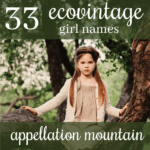 It’s a great candidate for revival among the new vintage girl names. Winifred probably felt impossibly out of favor just a few decades back. Derived from a Welsh saint’s name composed of the elements fair and peace, Winifred was whispered down the alley to its current form. After many years of steady use, Winifred slipped in the 1940s, before tumbling out of use entirely in the 1960s. The Wonder Years’ Winnie was actually a Gwendolyn. That made it a more realistic pick for a circa 1990 show set in the 1960s. Today, however, parents who grew up with Winnie Cooper are cautiously reconsidering Winifred. After years of around two dozen girls receiving the name annually, there were 100 Winifreds born in 2014, and 156 in 2015. No question Winifred is trending in the right direction. 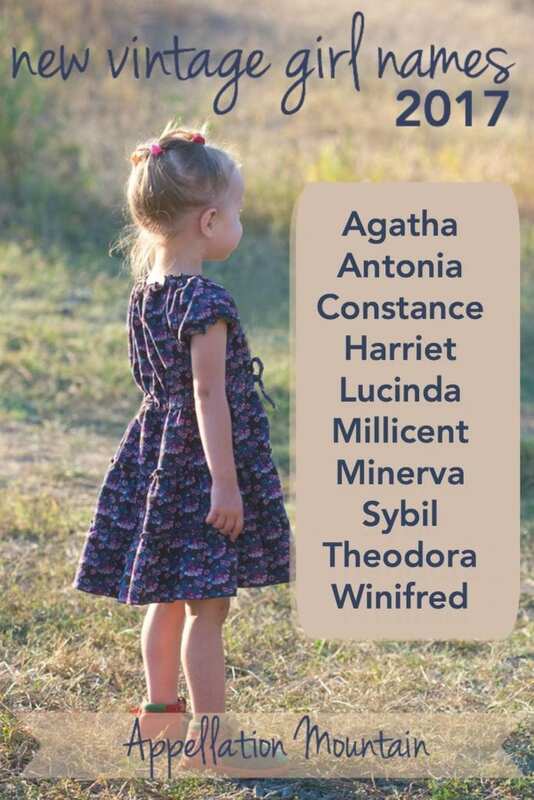 Would you add other names to this list of new vintage girls names? What are your favorites? Is Matilda too popular for this list? I think it would work. 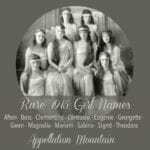 I also think Frances, Jane, Georgette, Ramona, Ruth, and Alberta are ready for revival. Love Sybil, Millie and Lucinda! I have a Winifred! We don’t tend to nicknames, but the other kids occasionally call her Winnie and Fred/die. I personally prefer the nick Fred or Freddie. I agree that Tabitha seems a good fit for this style. What about Georgina or Georgiana going by Georgie? Or Henrietta/Hettie (or Etta)? I have a Harriet, so it’s definitely a favourite! My other daughter is Susannah, and I think it may fit in this list. Everyone knows it, everyone seems to like it, no one seems to use it. We were nervous ourselves because we didn’t like any of the built in Sue nicknames … but decided if people could use Bella for Isabelle we could use Annie for Susannah. Except we don’t. It is always just Susannah (with the occasional Susannie just to push it in the right direction should we need to). 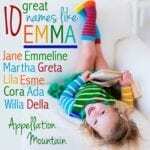 The girls’ names are rare, but not unique or overly different. And we love them! I always think of Tabitha as one of these sorts of names. With nicknames like Tabby and Tibby, it feels like one of the crowd. I love Agatha/Aggie! I think it’s still a bit old-lady sounding to non-name nerds so I’m not sure if I’d ever use it, but I love coming across birth announcements for baby Aggies. It occurs to me a Sybil could just as easily go by Billy, which I find kind of a nice, playful, down-to-Earth contrast to the serious, very feminine, slightly etherial quality of Sybil.